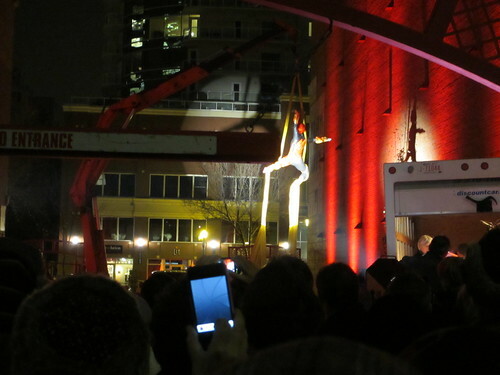 On Friday night, Mercury Opera turned a downtown parking lot on 104 Street into a veritable opera stage. 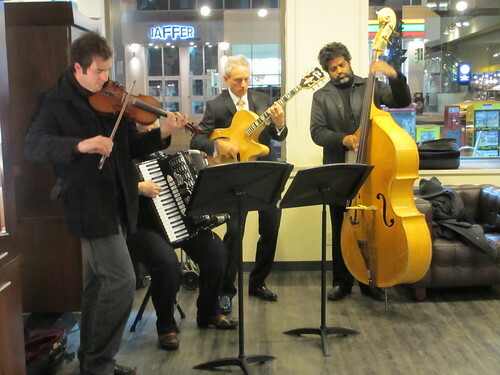 You may remember Mercury Opera from their innovative 104 Underground event last year, that saw a live performance orchestrated on the LRT platform of the Bay/Enterprise Square station. This year, Director Darcia Parada brought the opera out and onto the street with Fiamma (Italian for “flame”). It wasn’t clear on the website what the “gala” preceding the performance entailed, so we had a full supper before purchasing the $25 tickets at the Armstrong Building. 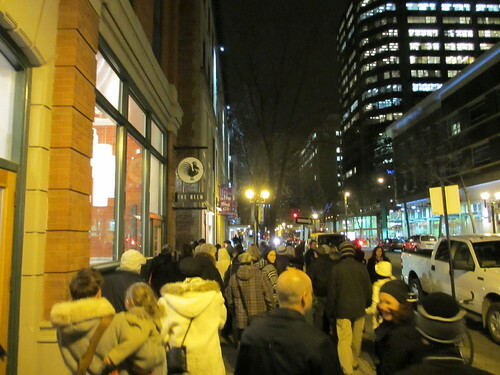 At that time, we were given a passport that would be honoured at nine different locations around 104 Street for drinks and treats. 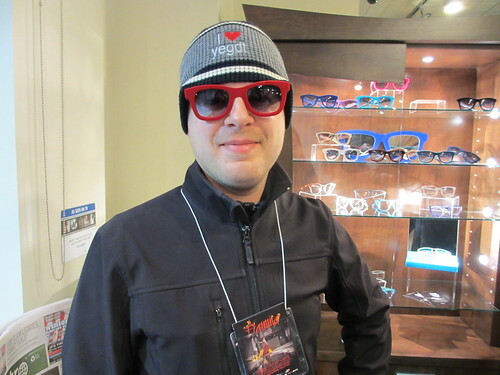 We didn’t end up having enough time to patronize all of the sites, but were able to sample from several of the businesses. The flow of food and drink was much more controlled this time around when compared with the 104 Underground as we had to redeem our passports to imbibe and eat. 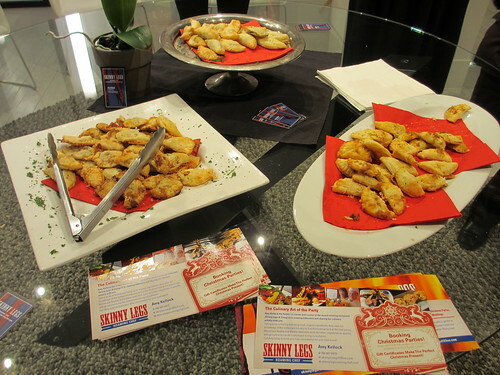 We enjoyed the return of Skinny Legs and Cowgirls (now as a “roaming chef”, or caterer), who served tasty wild mushroom crescents, snacked on fresh pretzels from Cook’s Corner, and satisfied our sweet tooth with cupcakes from Delish. 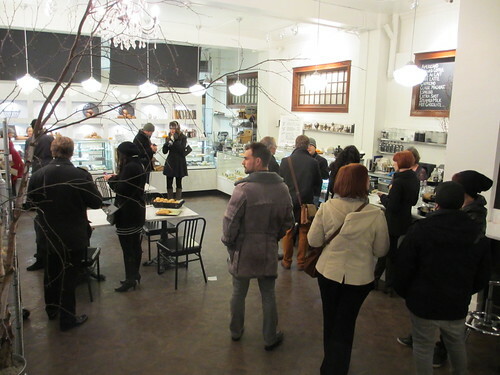 I think the organizers did a fantastic job of engaging small caterers and businesses to supply the food for this event. 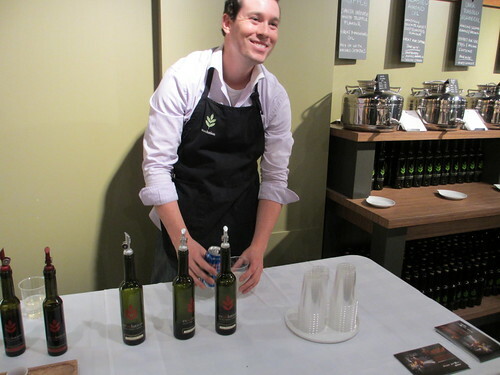 Evoolution also participated, serving sweet concoctions of drinking vinegar and club soda. We’d heard about this use for their flavoured vinegars, but hadn’t tried it ourselves yet. It was definitely an interesting spin on an Italian soda. 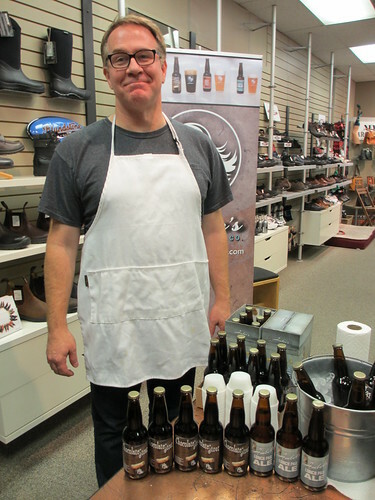 It was great to see Amber’s Brewing Company out and about, serving their first batch of beer produced at their new location of Hog’s Head in St. Albert. At 8pm, we gathered in the Melcor parking lot, admiring the lights that transformed the space. 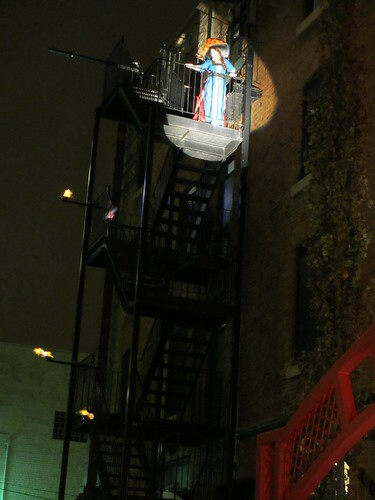 Then, led by a stilt walker, paraded down the Alley of Light to the other side of the parking lot. A cube van was curiously parked in the lot, but the mystery was soon revealed – the back door rolled up and exposed the musicians gathered inside. 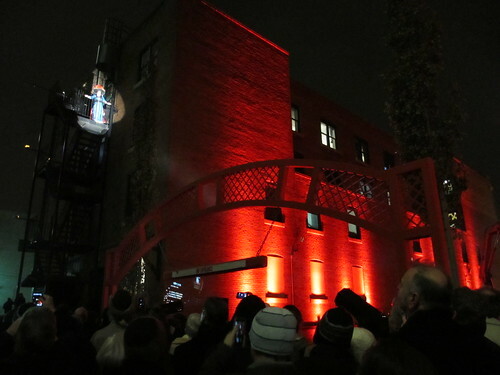 With that, the show began, a spotlight directed at an opera singer situated on the top of the Armstrong Block fire escape. The performer must have been freezing, but didn’t show it at all, her voice penetrating the cold night. 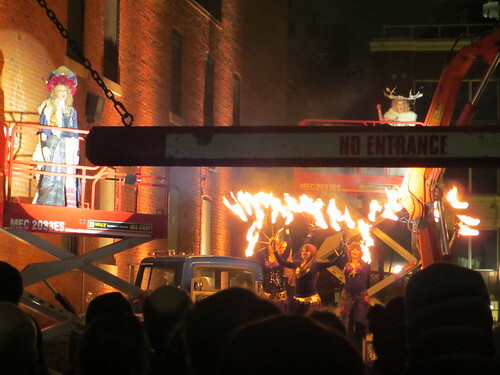 The show progressed to include other performers, located in the lot itself, and elevated slightly on mechanical lifts. At this point, the vantage point for spectators suffered a bit. The risers helped, but for any audience members not situated in the front row, the view was obstructed by the parking arch. But in a way, the location couldn’t be as perfect as a typical opera stage because of its guerrilla nature, and it was a suitable trade-off for this unique presentation of opera. Vibe Tribe, known for their fire dances, was a great inclusion, adding more visual interest with their flaming displays. With the rousing applause granted to the performers at the conclusion of the show, there was no doubt the crowd enjoyed Fiamma! We can only look forward to whatever Mercury Opera dreams up next, but surely, it will again be opera “where you least expect it”. Bravo!